Look who’s on the front page of the newspaper!! 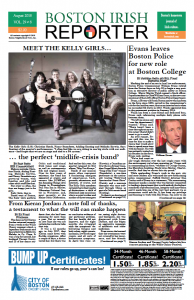 Sean Smith, a special contributor to the Boston Irish Reporter, featured the Kelly Girls in the August 2018 publication. He interviews each of the Girls and also reviews numerous songs on their “May You Always” CD.